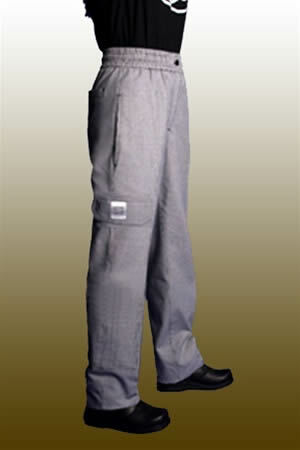 Womens Chef Pants. High Quality Womens Chef Pants and Trousers made in America. These are straight leg dress trousers, designed to fit the curves of female chefs. When you're tired of looking like the boys, choose these for a little more "umph" in your everyday work clothes! Made from the incredible line of Ultra Clean-Tex fabrics, these are crafted in the Ultra Lite PC fabric. This is a little bit lighter weight blend of poly cotton, but it still has the same killer ability to come clean and look great right out of the dryer. The waist is slightly lower (than on men's pants) and there is a bit more tapering around the mid thigh. This has a 2" wide elastic band built into the back of the waist (only) – which provides added comfort and a little more ease of movement. The front zipper is brass and the top closing button is a brass logo design. There are 4 nice pockets in this: two extra deep French cut front pockets and 2 flat back patch pockets. 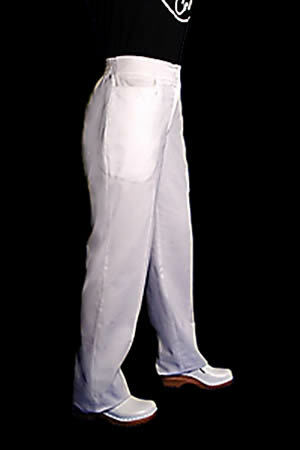 There's nothing that looks better than white chef pants – but only if they're clean! These stylish trousers are made out of Ultra PC 3000 – a proprietary poly cotton fabric blend that is remarkable at staying stain free wash after wash. And there's no need to press these – they look terrific right out of the dryer. Made for a woman's body, these pants sit slightly lower on the waist and are tapered around the mid thigh. The waistband closes with a brass logo button above the brass zipper. But the best part is that the waistband has a 2" wide elastic band just in the back part – allowing for greater comfort and easier mobility. The four nice pockets in these pants are very handy. There are two extra deep French cut front pockets and two flat back patch pockets. Great styling, design, comfort and durability all wrapped up in one pair of pants – pretty cool! 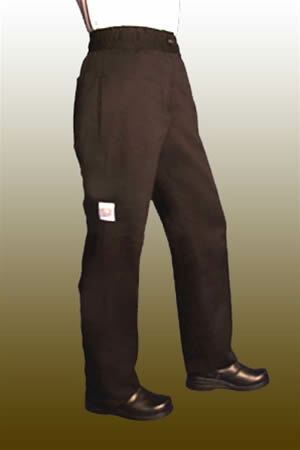 Comfort, style and practicality are all wrapped up in this one great pair of ladies chef pants. Built especially to fit a woman's body, these pants sit slightly lower on the waist. 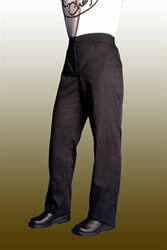 The mid thigh area is little tapered to give a leaner look to the overall pants. The cargo style is well suited for the chef who needs or loves to put lots of things in their pockets! It comes fitted out with two flat back patch pockets, two extra deep side seam front pockets, and yet another two mid thigh utility cargo pockets. The cargo pockets have velcro closures for easy access. The waistband is a nice 2" wide elastic, allowing for extra comfort and ease of movement. These have an attractive brass zipper and a heavy duty bras logo button at the waist. Once again, these are crafted out of the super great patented Ultra Lite PC fabric. This great poly cotton blend fabric is easy to clean, stays clean, and looks great straight out the dryer – with no need for ironing, let alone dry cleaning. A nice high performing pair of everyday chef pants. Tired of the plain black or white in chefs pants? Try on a pair of these great cargo trousers in a houndstooth pattern and you'll be hooked on both style and comfort! Hand crafted out of yarn dyed 100% natural cotton fabric, this fabric is not only soft, but it breathes well and holds its color pattern. These pants are not unisex; they're designed to fit a woman's body, and sit slightly lower on the waist and are tapered around the mid thigh. They have a 2” wide elastic waistband, which as you know, allows you more freedom of movement and tends to be more comfortable. Plenty of pockets abound in cargo pants and these are no exception! There are two classic mid thigh utility pockets with velcro flaps. There are two extra deep side seam pockets and yet another two pockets in the back, that are a flat patch pocket. There's a front brass zipper and a nice heavy brass logo button at the waist. These are a great pair of ladies chef pants in a nice style and pattern.